Day 0 and 1 - Getting to Iguazu and our first impressions. Twenty-Six Hours ... that it how long it took, counting flight times and layovers, for us to get to Iguazu. I watched three movies (all animated of course) during our flights and I didn't sleep much so when we arrived at our first destination, the first of seven, I was pretty tired. The Wife was tired too. Our guide and driver picked us up at the airport and, on the way to our hotel, told us about the falls, the park surrounding the falls, and the wildlife in the area. The guide asked if we wanted to start our tour that afternoon but we were tired and thought it would be better to start the tour the next day after we'd had a chance to sleep. They dropped us off at our hotel, located in the park, and we marvelled at the view across the road. After getting out bags in our room we headed across the street and admired the view of Iguazu Falls from the Brazilian side. Last year I'd been somewhat disappointed with Niagara Falls but Iguazu did not disappoint. The multi-tiered falls seemed to go on forever. The falls seemed to go on forever. From the lookout point a trail followed the river canyon wall down. I followed the trail for a bit taking pictures along the way. About half way down I stopped and turned around. We would be walking this trail again tomorrow with our guide so I would see more of it the next day. On the way back up the Wife and I stopped at a small snack bar and had an ice cream bar and watched the coatimundi harass people for their food. Day 2 - Taking in the amazing Iguazu Falls. 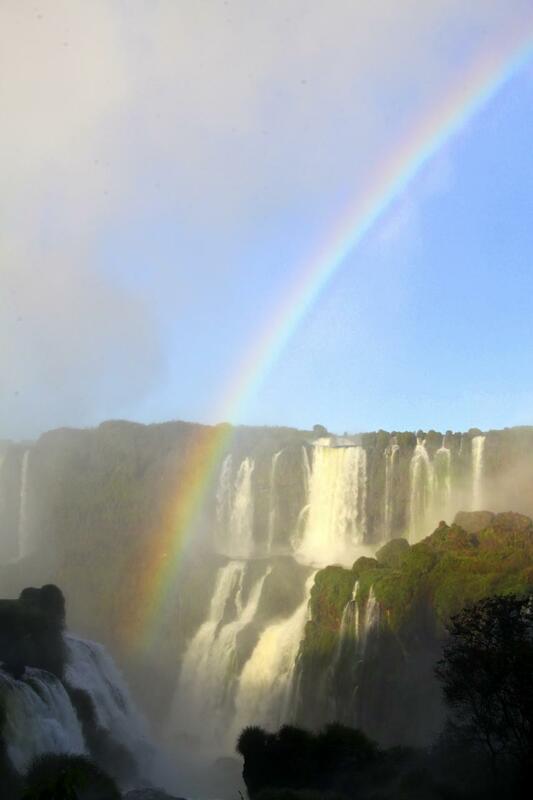 Iguazu is the land of rainbows. It was winter in Brazil and there was frost on the grass this morning. Our guide met us at our hotel and we crossed the road to the overlook we'd visited the night before. Yesterday it was clear. Today, the chill of the air brought on clouds of fog obscuring some of the falls. The mist cleared as the morning warmed up and we walked along the trail. At the bottom the trail connects to a walkway that extends over the lower tier of the waterfalls. We walked out onto the walkways and were doused with spray from the upper falls. Everywhere we looked there were rainbows. I saw more rainbows in this one park than anywhere I can recall. We returned to the road along a steep path and were picked up by our driver. We crossed the border into Argentina to see the sights from the argentine side. After being dropped off we walked along a trail that offered incredible views of small and large waterfalls. It seemed to go on forever. The path we followed ended at a train station. We took the train to a point closer to the main falls. From there a walkway built over the river took us to the Devil's Throat falls. The overlook platform was full of people watching the power of the falls. It was very impressive. We walked back to the train station. Along the way we saw turtles sunning themselves and birds waiting for food to be dropped. This vacation would become a bird-nerdy type of vacation. A ride back on the train and a short walk took us to a place for lunch. We rested from our morning walking with good food and a few magnets for our collection. I watched some coatimundis try to steal people's picnic food. The day before our guide had offered us a couple choices for afternoon activities. We could take a helicopter ride over the falls or we could take a boat ride under the falls. We'd seen, from the overlook near our hotel, the boat ride we could take and we chose that option for the afternoon. We walked down a steep trail, past smaller falls, to the boat docks. We were given dry sacks for our valuables and lifejackets before getting in the boat. The boat took us near one of the falls. Some people had ponchos but the spray still got you all wet. The boat backed off of the falls, turned a corner in the river and approached a smaller set of falls. If you were not wet now you would be soon as the boat went straight into the falls. We were totally submerged in the falls. I got soaked all the way down to the underwear. We boated down the river to a second dock where we got off. There was two small bathrooms where people crowded into to change into drier clothes. I only changed my pants. We got in the back of a truck and drove through the jungle as a guide pointed out types of trees and birds and explained the history of the area and park. The truck dropped us off at the park visitor's center where we were picked up by our guide and driver We saw our first toucan in a tree at the visitor's center..
We headed back to the hotel stopping along the way at a store to buy more magnets and a Mary for the Wife. We were pretty exhausted by the time we got to the hotel room. We sent a load of wet clothes to housekeeping to get dried (a free service of the hotel) before eating a delicious dinner at the hotel bar. We ended the day warming up in front of a fire in one of the hotel's sitting rooms. Day 3 - A day of transition. Our guide and driver picked us up and took us to the airport. After checking in and passing through security I heard my name being paged. I was taken back through security to find our guide. Turns out we both forgot about paying for the boat ride. I went back through security to get my money and back out to pay him before going back through security. Fortunately I was waved through security each time and bypassed a few security steps each time. The flight was on time and nothing special. We were served ham flavored toasted snacks which were a bit unique but tasted great. Can't think of an American snack that is meat flavored. Pictures can be found in my 2016-06 Iguassu Falls, Brazil Google Photos album. NOTE: We took pictures of the Wife's cousin's Snuggle Bear during our travels. I will put together a post about his travels along with all the pictures I posted on Facebook in the next few weeks. Book: Randall Munroe's "What If"